The following is the Boxing Insider notebook for the week of January 9th to January 16th; covering the comings and goings in the sport of boxing that you might have missed. Golden Boy Promotions will continue its partnership with ESPN for this exciting new year with an explosive main event featuring 126-pound contender Joseph “JoJo” Diaz, Jr. (25-0, 13 KOs) defending his NABO Featherweight Title against former world champion Victor “Vikingo” Terrazas (38-4-2, 21 KOs) on the Feb. 22 edition of Golden Boy Boxing on ESPN at Fantasy Springs Resort Casino inIndio, Calif.Doors to the Special Events Center open at 5:00 p.m. PT, and the first non-televised bout starts at 5:30 p.m. PT. ESPN2 and ESPN Deportes will transmit the fights beginning at 11:30 p.m. ET/8:30 p.m. PT, and the ESPN3 transmission will begin at 10:00 p.m. ET/7:00 p.m. PT. Diaz Jr., a 25-year-old prodigy of South El Monte, Calif., was an exceptional amateur prospect who was part of the 2012 United States Olympic Team. After making his debut with Golden Boy Promotions in December 2012 at the now-defunct LA Sports Arena, Diaz, Jr. climbed the 126-pound rankings defeating one tough opponent after another. Diaz, Jr. had a great 2017 as he participated in two Pay-Per-View events. In the HBO-televised undercard of Canelo vs. Chavez, Jr., Diaz, Jr. cruised to a 10-round unanimous decision victory against the previously undefeated Manuel “Tino” Avila. Diaz, Jr. then defeated Rafael “Bing Bang” Rivera via dominant 12-round decision in the co-main event of the historic Canelo vs. Golovkin HBO pay-per-view event. Diaz, Jr. will look to continue his path to a world title with a win on Feb. 22. Terrazas, a 34-year-old native of Jalisco, Mexico, is a former world champion who defeated Cristian “El Diamante” Mijares to capture the WBC Super Bantamweight Title. Terrazas, a student of the traditional Mexican school of boxing, has fought fighters at a world championship level from different parts of the world, and will bring years of fighting experience into his fight against Diaz, Jr.
Vergil Ortiz, Jr. (8-0, 8 KOs), a super lightweight prospect who has delighted fans with his tremendous knockout power, will return in the eight-round co-main event. After debuting as a professional in 2016, Ortiz, Jr. has never heard the final bell of a bout, and he’s anxious to retain his 100% knockout rate in the year 2018. One must definitely not lose sight of this sensational Mexican American who has his roots in Michoacan, Mexico. The explosive undercard will be stacked with the best and brightest prospects of the exclusive Golden Boy Promotions stable. Lightweight knockout artist Christian “Chimpa” Gonzalez (18-1, 15 KOs) will make his highly anticipated ring return over a scheduled eight rounds of action in his Fantasy Springs Resort Casino debut. Gonzalez is a hard-hitting prospect who is coming off two spectacular wins, the last of which was against Gamaliel “El Platano” Diaz. Manny “Chato” Robles III (14-0, 6 KOs), after making his headlining debut in Sept. of 2017, will square off in an eight-round featherweight fight. Power punching prospect Edgar “Kid Neza” Valerio (10-0, 7 KOs) of Ciudad Nezahualcoyotl by way of South Central, Los Angeles, California will start the year off with a bang in an eight-round battle in the 126-pound division. Hector “El Finito” Tanajara, Jr.(11-0, 4 KOs) of San Antonio, Texas will open the evening of very exciting combats in an eight-round super featherweight fight. In the night’s swing bout, Genaro “El Conde” Gamez (6-0, 4 KOs) will participate in a six-round lightweight fight. Opponents for these exciting, rising prospects will be announced shortly. Unbeaten middleweight contender and IBF No. 1 challenger Sergey Derevyanchenko (11-0, 9 KOs, WSB: 23-1, 7 KOs) will enter the ring for an eight-round bout as part of an exciting undercard on Saturday, January 20 from Barclays Center, the home of BROOKLYN BOXING®. The Premier Boxing Champions event is headlined by welterweight world champion Errol Spence Jr. taking on two-division champion Lamont Peterson live on SHOWTIME (9 p.m. ET/6 p.m. PT). Lightweight world champion Robert Easter squares up against two-division champion Javier Fortuna. The SHOWTIME CHAMPIONSHIP telecast will be available in Spanish via secondary audio programming (SAP). Additional action inside of the arena will see the brother of Lamont Peterson, once-beaten Anthony Peterson (37-1, 24 KOs), facing Luis Florez (23-7, 19 KOs) in a 10-round super lightweight matchup plus once-beaten welterweight Ivan Golub (13-1, 11 KOs) in an eight-round fight against Colombia’s Fidel Monterrosa (38-14-1, 30 KOs). Undercard fights continue with undefeated 2016 Haitian Olympian Richardson Hitchins (3-0, 1 KO) entering the ring for a four-round welterweight fight against Preston Wilson (4-2-1, 3 KOs), Philadelphia’s Dylan Price (4-0, 4 KOs) competing in a four-round super flyweight bout against Nestor Ramos (7-7, 3 KOs) and welterweight prospect Keyshawn Williams (1-0, 1 KO) taking on Denis Okoth (1-0, 1 KO) in a four-round matchup. Rounding out the night is a four-round showdown between unbeaten Desmond Jarmon and Dallas-native Charles Clark plus New Jersey’s Matthew Gonzalez in a six round middleweight fight against Alexander Serna. A highly decorated amateur who represented his native Ukraine in the 2008 Olympics, Derevyanchenko now lives and trains in Brooklyn and most recently earned the top spot in the IBF rankings with an impressive 12th round stoppage over Tureano Johnson. The 32-year-old also defeated previously unbeaten Kemahl Russell in 2017 after his 2016 saw him earn a TKO victory over Mike Guy in March before stopping former champion Sam Soliman in the second round of a world title eliminator in July. The unbeaten fighter defeated a slew of experienced contenders in 2015 with wins over Elvin Ayala, Alan Campa, Vladine Biosse and a third-round stoppage of Jessie Nicklow. Derevyanchenko and Golub make it a pair of Ukrainian sluggers fighting out of Brooklyn who will compete on the undercard looking to put on impressive performances in their adopted hometown. Two-division world champion Lamont Peterson hosted a media workout in his hometown of Washington, D.C. Thursday as he prepares to take on unbeaten welterweight world champion Errol Spence Jr. Saturday, January 20 live on SHOWTIME from Barclays Center, the home of BROOKLYN BOXING® and presented by Premier Boxing Champions. The SHOWTIME CHAMPIONSHIP BOXING begins at 9 p.m. ET/6 p.m. PT and features lightweight world champion Robert Easter battling former champion Javier Fortuna. “I feel great. I’m already close to weight. I’m happy and eating up to five times a day. I feel strong and I’m ready for this fight. “I have to look at this as really just another big fight. When you’re at the top, you try not to make too much of each fight. We know what’s at stake. I know that when I keep it simple, that’s when I perform best. “Right now my body feels better than ever. I’m comfortable with everything that’s gone on in camp and I think you can see it in my body. “I’ve always trained hard since the first day I came here as a child. That’s been instilled in me since a young age and it’s carried me throughout my career. “Everything I do is for D.C. I’m trying to get as much recognition for this area the best way I can. That’s what we all strive for in this gym. This is the biggest one that’s been on the schedule for a while and I’m ready to bring it home. Unbeaten two-division world champion Rances Barthelemy and former title challenger Kiryl Relikh will both look to kick off their new year with a world title victory when they meet in a rematch for a vacant 140-pound title Saturday, Feb. 10 live on SHOWTIME from the Alamodome in San Antonio in an event presented by Premier Boxing Champions. The SHOWTIME CHAMPIONSHIP BOXING telecast begins at 10:15 p.m. ET/PT and will be headlined by three-division world champion Mikey Garcia (37-0, 30 KOs) taking on unbeaten 140-pound world champion Sergey Lipinets (13-0, 10 KOs). Barthelemy and Relikh will fight for the WBA’s vacant Super Lightweight World Title after their title eliminator bout in May ended in a debatable decision for Barthelemy. This time the fighters will look to leave no doubt with the full title on the line. “This is my second time fighting for a world title and it will be a second lesson for me,” said Relikh. “This is my time to become champion. I need to do much more during this fight. “Winning this title would be a dream come true for me,” said Barthelemy. “I’d be the first Cuban fighter in history to win a title in three different divisions. The last fight was very close and deserving of a rematch. 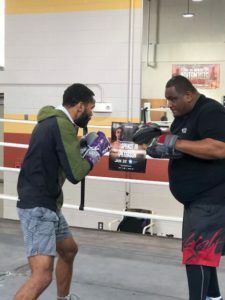 Both fighters have sacrificed in training camp on the road to what they hope will be a celebratory moment on February 10, training hard through the holiday season to stay on target for fight night. With two belts in the 140-pound division on the line in the same night, the winner between Barthelemy and Relikh will be in a great position to begin a path toward unification after February 10.